Ostensibly, Australia finished the second day at the SCG in front. In reality, this was a much more even day's play than most throughout the series, and one that will give Sri Lanka some hope of upsetting Michael Clarke's men - a slim hope, perhaps, but a hope nevertheless. It was a day on which David Warner, Phillip Hughes and Clarke all scored half-centuries yet failed to bury Sri Lanka. It was a day on which run-outs cost two of Australia's top five their wickets, one a result of laziness and the other due to a poor call. 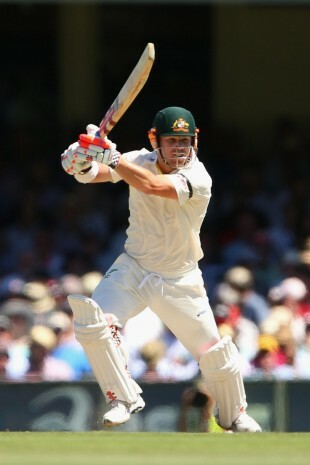 By stumps, Australia's lead had reached 48 runs thanks largely to the acting No.6 Matthew Wade, who was unbeaten on 47. Peter Siddle was with him, on 16, and Sri Lanka's challenge was to ensure Australia's lower order and tail-enders didn't drag the game out of their reach. Much will depend on how quickly the Sri Lankans can finish things off on the third morning and how well they then bat themselves, but on a pitch that was quickly drying out they knew that even a seemingly small target could be tricky for Australia in the fourth innings. First, they need to get through Wade, who appeared to take his increased responsibility seriously. He was not always comfortable against spin but fought through, surviving a prod to short leg on 22 that was put down by Lahiru Thirimanne and being reprieved by a review on the same score when he was given out caught at short leg, only for replays to show the ball lobbed off his pad and did not touch bat or glove. Rangana Herath was denied on both occasions, but his spin will only become harder to handle as the match wears on and the pitch wears down. Soon afterwards, the second new ball accounted for Mitchell Johnson, who edged behind off Nuwan Pradeep for 13, and that ended a 36-run partnership between Johnson and Wade, who had come together after a moment of rashness from Clarke. Australia's captain appeared to have started 2013 in much the same way as he cruised through 2012, finding gaps, using his feet to spin and generally making life difficult for his opponents. But on 50, he went for a slog sweep of Herath and his top edge was taken at midwicket. It was far from Australia's only lapse in judgment. Michael Hussey was the victim of another such brain fade, when Clarke called him through for a single that wasn't there. At 37, Hussey remains one of the quickest runners in world cricket and even a full-stretch dive could not save him from Dimuth Karunaratne's direct hit. Hussey's innings, which had started with a guard of honour from the Sri Lankans, ended on 25, and while there is a strong chance he will bat again in the second innings, it was far from what Hussey wanted from his final Test. Karunaratne's throw was sharp and accurate, and the Sri Lankans were to be commended for their fielding on several occasions. The day began with another run-out and while Pradeep's work in the deep was responsible for it, so too was an awful piece of running from Ed Cowan. On 4, Cowan ambled through for the first run when Warner pushed a ball into the leg side. There should have been a comfortable two, but Cowan's slow movement, sluggish turn and a slight hesitation combined to cost him his wicket. That brought Warner and Hughes together and they put on 130 for the second wicket as runs flowed through the off side when Sri Lanka's seamers gave them width - which was often. Hughes picked up nine boundaries in his innings, cutting and cover-driving well and he also pulled a boundary forward of square leg off Pradeep. Warner's ten boundaries all came through the off side, including one to backward point off Pradeep to bring up his half-century from his 37th delivery. However, on 85 Warner threw away the chance for a hundred, skying a catch to long-off when he tried to clear the boundary off Tillakaratne Dilshan. Hughes also missed out on his century when on 87 he went for a cut to a Herath ball that stayed low and was a touch quicker than the batsman anticipated, and his toe-edge was very well collected by the wicketkeeper Dinesh Chandimal. The day could have been even better for Sri Lanka had Herath been able to convince Mahela Jayawardene to ask for a review from the first ball Clarke faced. Aleem Dar turned down Herath's appeal and replays showed the decision would have been overturned has the Sri Lankans reviewed. Had they done so, they might even have ended the day with a first-innings lead. As it was, they ended up behind but with the knowledge that if they start day three well, anything can happen.